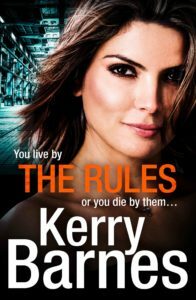 The Rules by Kerry Barnes is a contemporary crime thriller that will draw the reader in from the start. There is a fine line between the villains and the heroes, with plenty of anti-heroes in between. It is a line that becomes ever more blurred as the novel progresses. Trust is high on the agenda but with crosses and double crosses the reader wonders just exactly who are the ‘good guys’? Within the novel there are themes of drug taking, supply and demand, gangland wars and violence. It is not a novel for the faint hearted but it is a complex and well thought out plot. 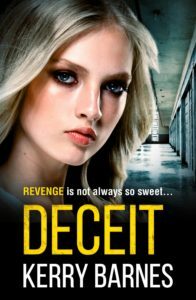 Deceit by Kerry Barnes, oh wow what an amazing, heart racing, fabulous contemporary psychological thriller. Once I picked it up, I could not put it down. The novel breaks down long held preconceptions as we enter the world of a women’s psyche and see inside the prison walls – both literal and psychological. The walls we build in our mind are as much a barrier as actual brick walls. Life deals us a certain hand, what we do with it is up to us but we must remember “actions have consequences.” No matter how much “I wish I could turn the clock back,” we cannot. The novel is about truth and lies. “Plotting the next lie.” It is up to the reader to work out the fact from the fiction. The problem with lies, is the more we tell, the deeper we go until even we find it hard to distinguish the truth.